Whilst wandering the paths of Woods Mill, you may well catch sight of a slightly dumpy dark brown bird as it disappears into the reeds. Its structure and behaviour are in many ways similar to that of a wren, albeit a supersized version. Whilst a wren will rarely breach 10cm, this bird is closer in size to a house sparrow, at around 13.5cm in length. It has a tendency to stay either on or close to the ground and spends the majority of its time skulking secretively in the reeds, reluctant to come into the open or move into view. It will, however, eventually reveal its presence and this is usually via its explosive and uniquely distinctive outbursts of song. The song marks this species as a Cetti's warbler, Cettia cetti. The Cetti's will sing all through the year, though they are particularly quiet when undergoing moult during late summer. The male's song is truly unmistakable - powerful, far carrying and positively angry. It can even be interpreted in a number of ways, such as - "You! See You! See you, see you, see you, see you!" or maybe "Listen! What's my name! 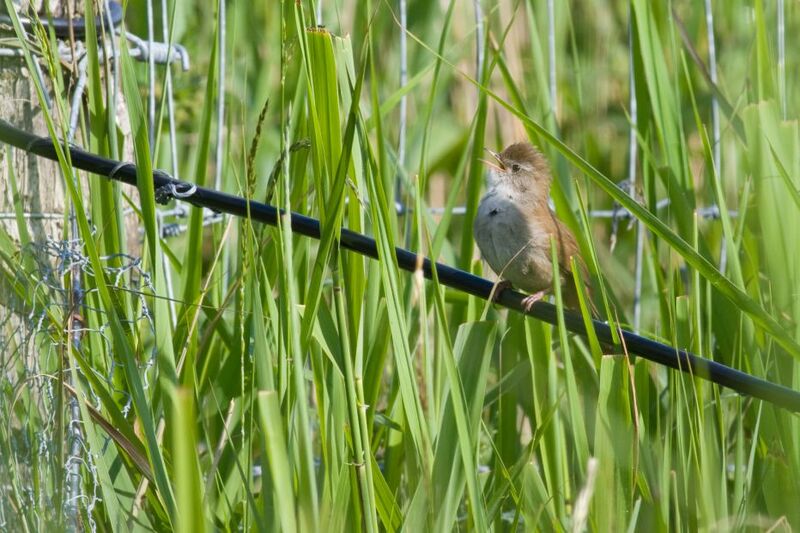 Cetti, cetti, cetti, that's it!" Even its calls are similarly distinctive, often an abrupt "chip...chup...stip...plik or pliit," sometimes reminiscent of a great spotted woodpecker. Perhaps the most frustrating thing about Cetti's warbler is its tendency to fly low and fast immediately after singing, making observation exceptionally difficult. The Cetti's also has a characteristic unique amongst British song birds - it has only ten tail feathers as opposed to the more typical 12. Admittedly this is something unlikely to be observed on a bird rapidly disappearing into the undergrowth! Its tail is, however, particularly full and rounded and they tend to spend much time cocking and jinking it, again very characteristic of a wren. 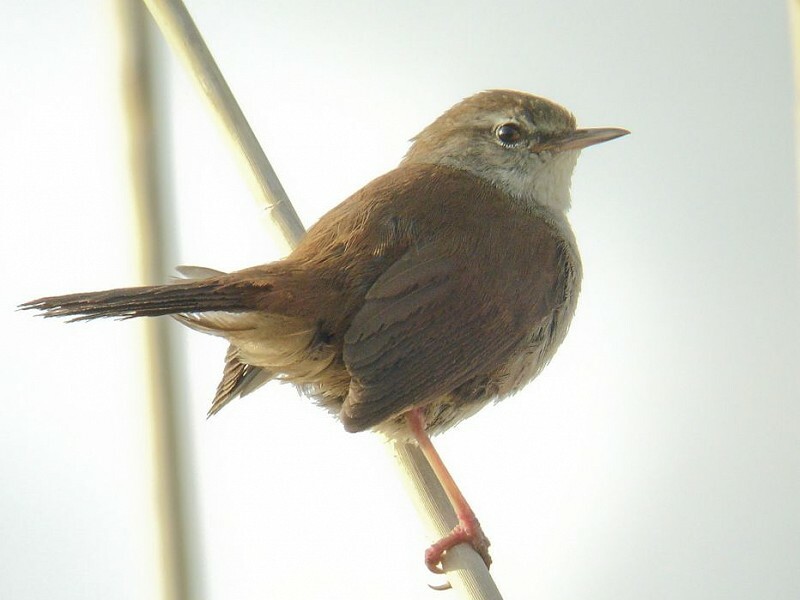 Though they share their habitat with similar species, such as the reed warbler, Acrocephalus scirpaceus, their behaviour and posture is entirely different. A close view of a Cetti's will show them to be rich red-brown above, silvery-white on the throat, dingy white on the breast, with brown flanks, a narrow white supercillium (above the eye) and fleshy pink legs. 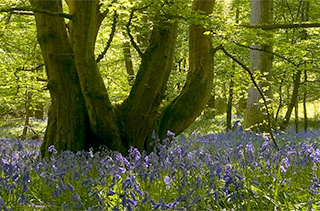 The small British population are largely sedentary and were first recorded breeding in 1973. In recent years more than 2500 singing males have been recorded, though they're typically found in Southern England, East Anglia and South Wales, rarer North of the Midlands. Though our population is mostly resident, it's thought a number of birds may migrate to continental Europe for the winter. Unfortunately for those that stay (like many small passerines) they're particularly susceptible to harsh winters, suffering catastrophic declines in severe and icy weather. Typically found in damp, dense, scrubby terrain fringing reedbeds, the large-scale drainage of wetland areas has led to the majority of their population being found on nature reserves. We hope that the recent wetland restoration works at Woods Mill will continue to assist in helping them thrive in Sussex.